Between 1750 and 1850 Britain went through a series of changes in industrial technology, organisation of labour, finance of business operations and methods of goods distribution which is commonly called the ‘Industrial Revolution’. 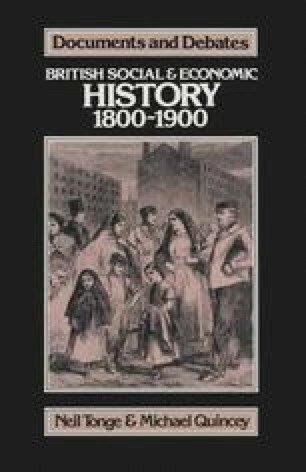 The population of England and Wales doubled between 1800 and 1850 and almost doubled again between 1850 and 1900. Large sections of the population were grouped together in conurbations, so that periods of prosperity, such as 1850–70, and slump, like the ‘Hungry Forties’, were experienced with a new immediacy. The problems thrown up and highlighted by the fluctuations of the industrialised economy demanded action in response. This volume is concerned with the response to the effects of the Industrial Revolution: the response of government, of society in general, of particular groups within society and of individuals. Sometimes their reactions coincided, at others they varied and conflicted. The results of their interaction, for good or ill, determined the new socio-political shape of Britain in 1900.